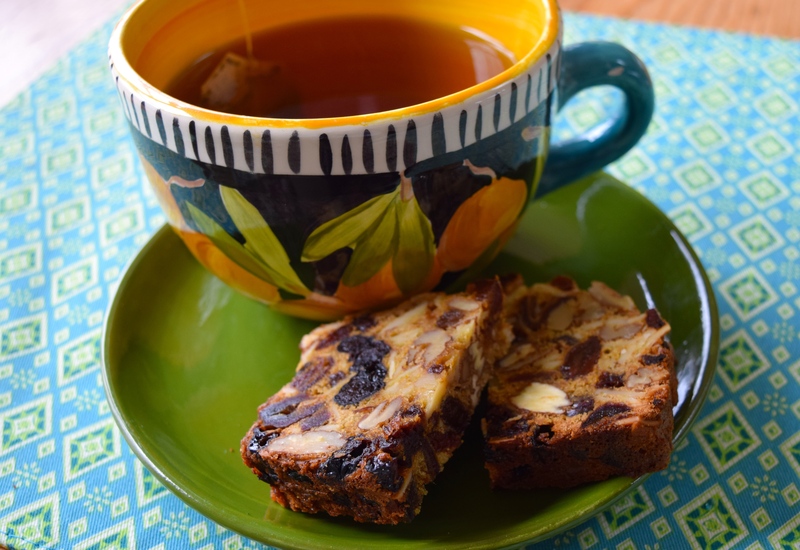 Okay, it’s fruitcake. I’ve been trying to figure out another name for this outrageously delicious bread that does not conjure up Christmas and cross-sections of red and green dried cherries, but to no avail. 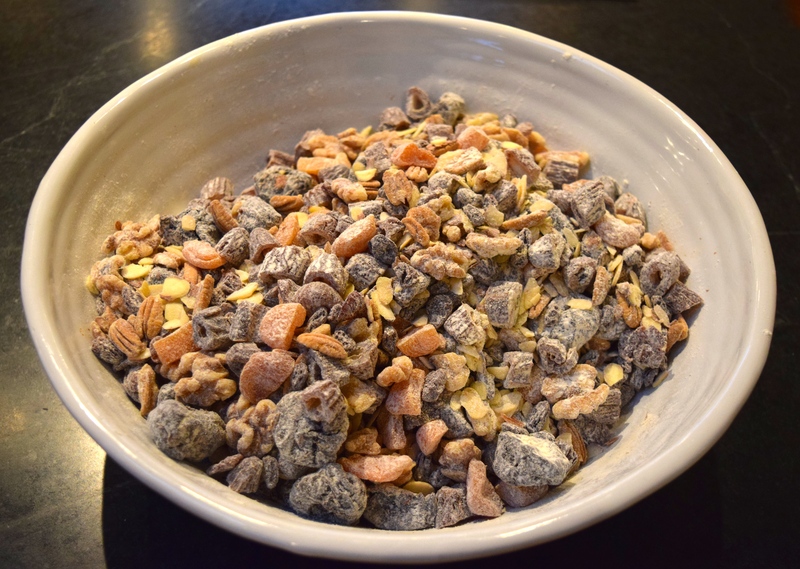 I tend to keep large bags of dried fruits and nuts in the house, so when it comes time to make this recipe, I simply pour a variety of them into a bowl placed on the digital scale and keep adding until the scale reads 3 pounds, 4 ounces. I then pour in the nuts until the scale reads 5 pounds. Easy-peasy. 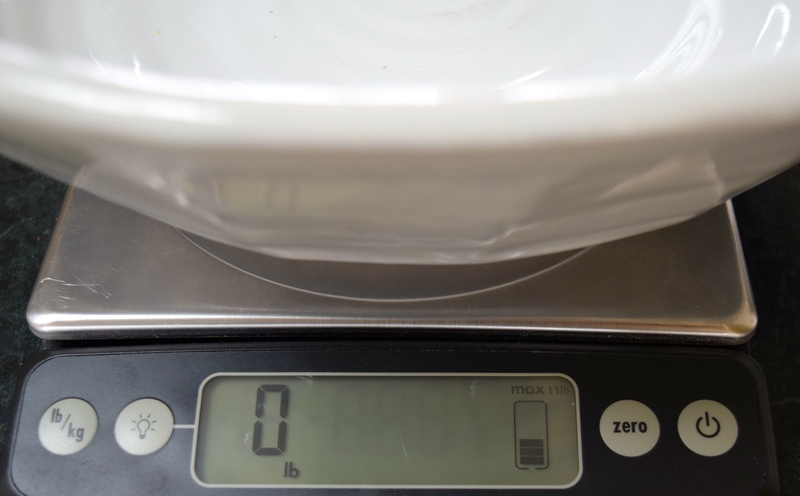 A digital scale is a good tool to have in the kitchen. I recommend this one by OXO. It can weigh items up to 11 pounds. After three years of owning it, I haven’t once needed to change the batteries. It makes zeroing out the container you are using very easy and even has a “zero” button. 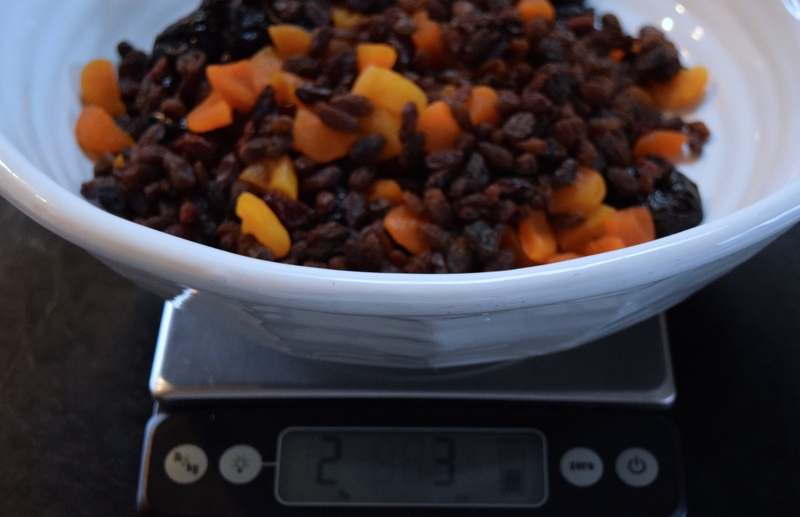 You’ll need to weigh the mixing bowl and “zero” that weight out before adding the fruits and nuts. To do this place the large empty bowl on the scale. This one weighs 5 pounds and 2.5 ounces. Push the “zero” button on the right. 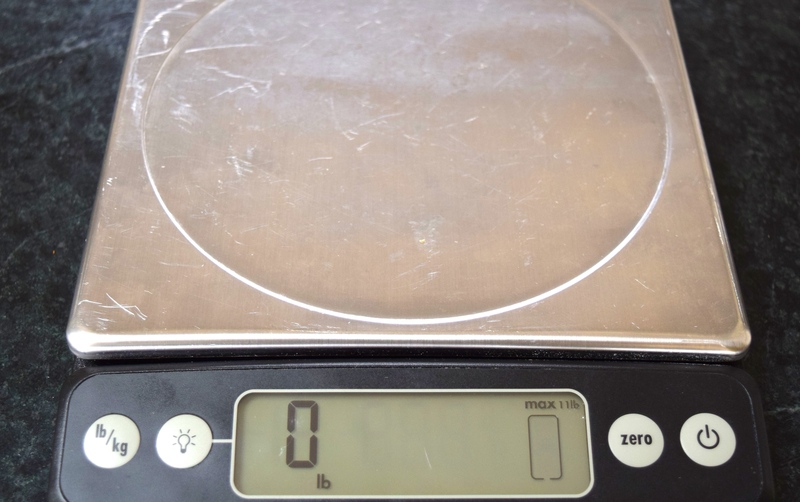 The scale is now ready to show the weight of just the ingredients in the bowl. 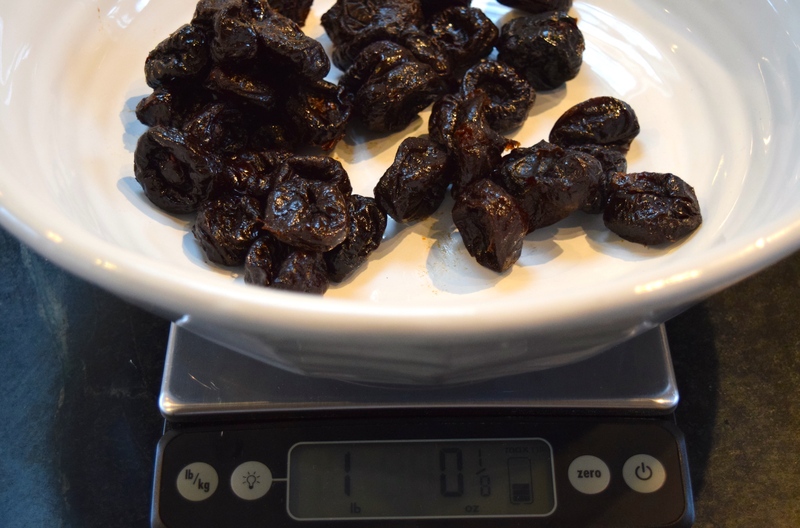 8 oz raisins + 17 oz pitted dates (cut each in half) = total of 52 oz. 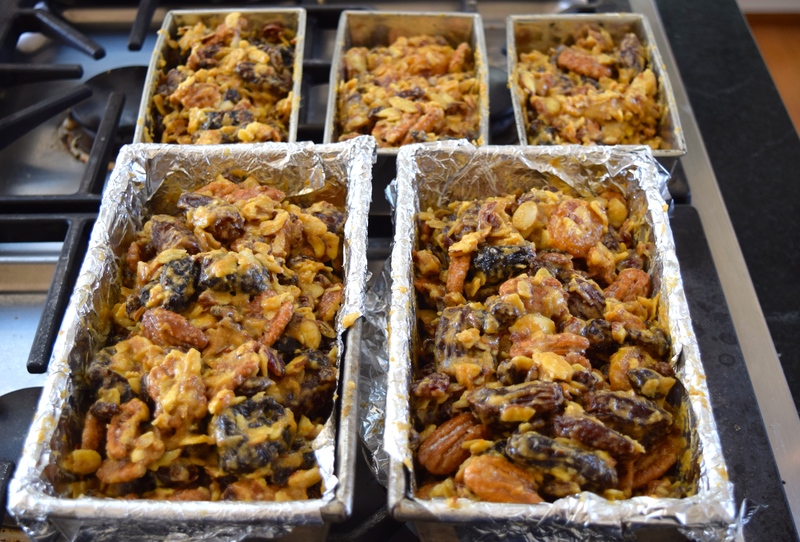 16 oz pecans + 8 oz walnuts + 4 oz slivered almonds = total of 28 oz. There is now a total of 5 pounds of fruits and nuts in the bowl! Next, add ½ cup of all-purpose flour to the bowl and mix with your hands to break up the fruits that are sticking together. Make sure every fruit and nut morsel is coated with the flour. Coating fruits and nuts with flour helps to keep them from sinking to the bottom of the pan while baking. Separate the eggs into whites and yolks. 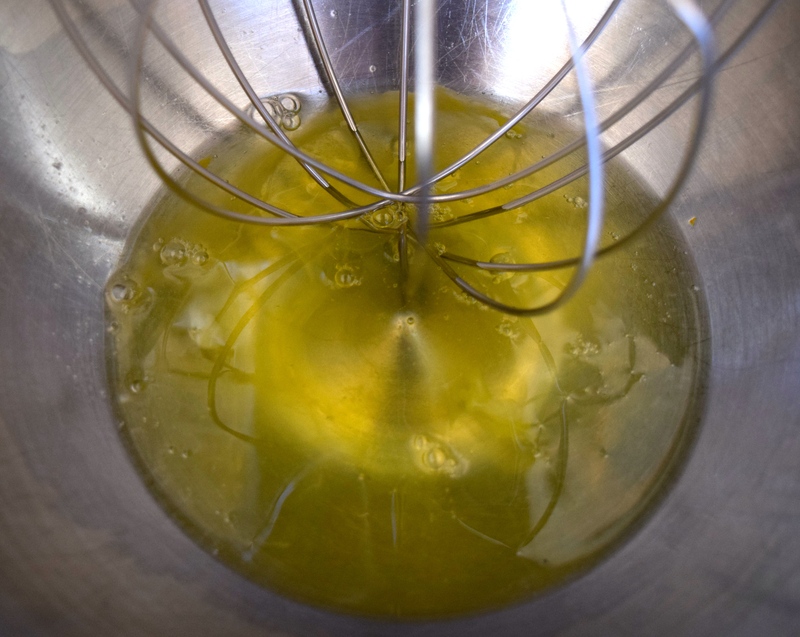 Beat egg whites on high speed in a clean, dry, mixing bowl until the whites puff and form peaks and then stop beating. You don’t want to overbeat the egg whites. 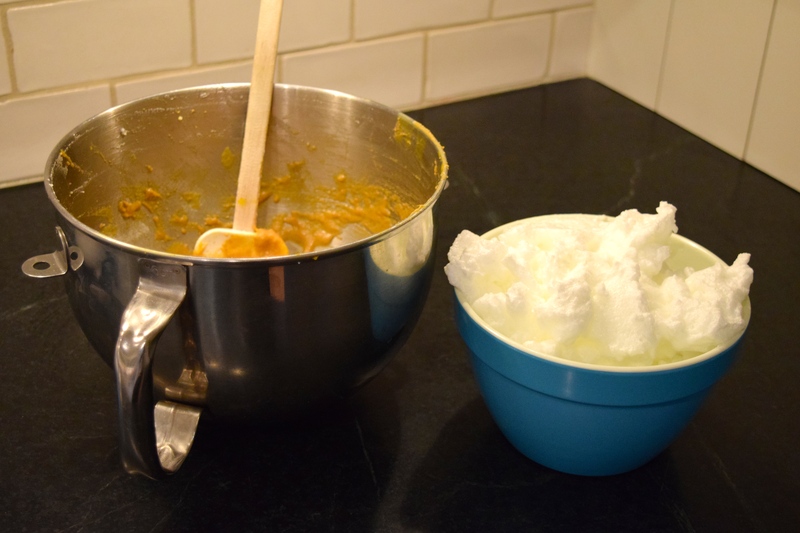 Use a rubber spatula to spoon egg whites into a separate bowl. Set aside. 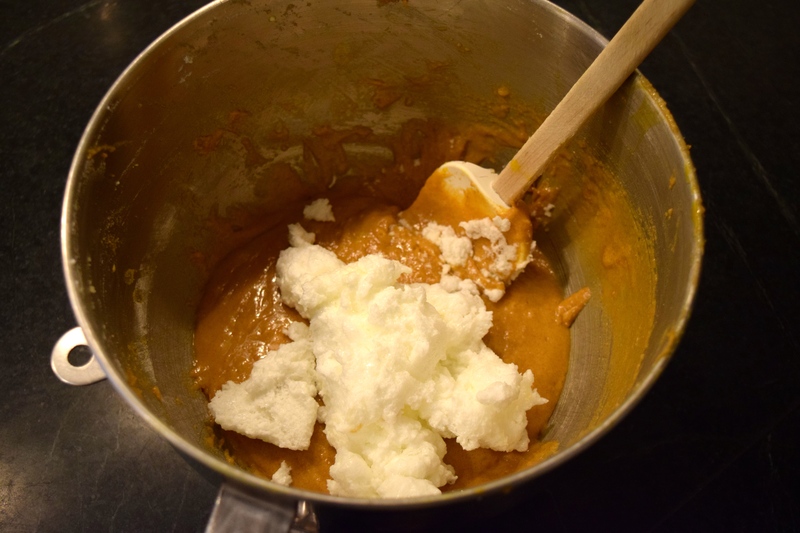 Next, add the eggs and sugars to the mixing bowl (no need to wash it first) and cream ingredients together for 2 minutes on medium-high speed. 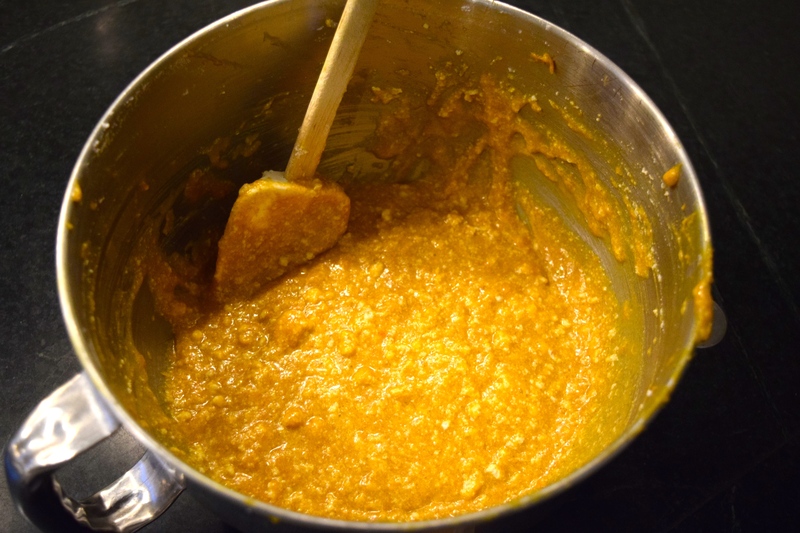 Note the rich orange color of the egg yolks. Those eggs are from my free-ranging backyard flock. Amazing color! 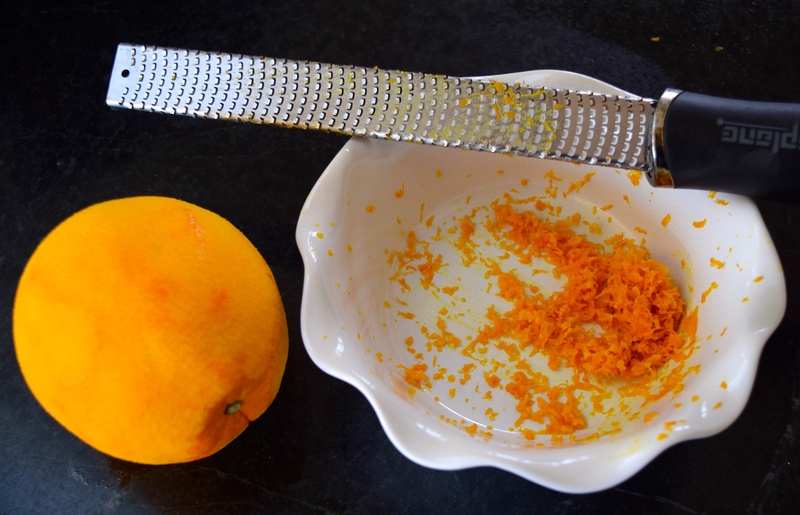 Add the grated zest of one orange.To learn more about zesting citrus, go here. 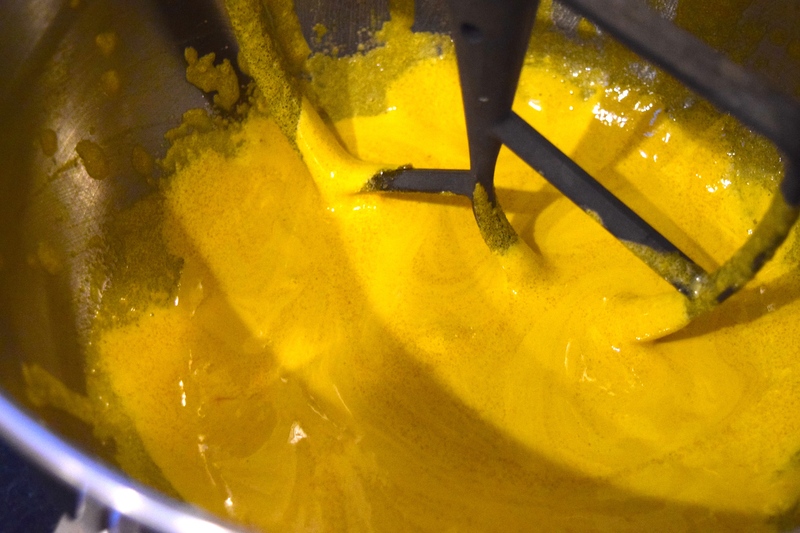 Add melted butter, heavy cream, and vanilla and almond extracts to the batter and mix for one minute on medium speed. 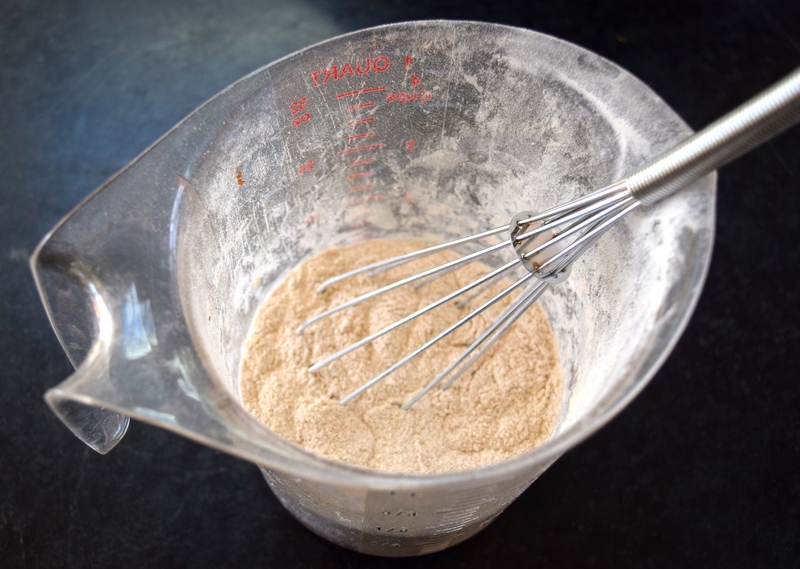 In a separate small bowl, use a whisk to mix the whole wheat flour and baking powder. 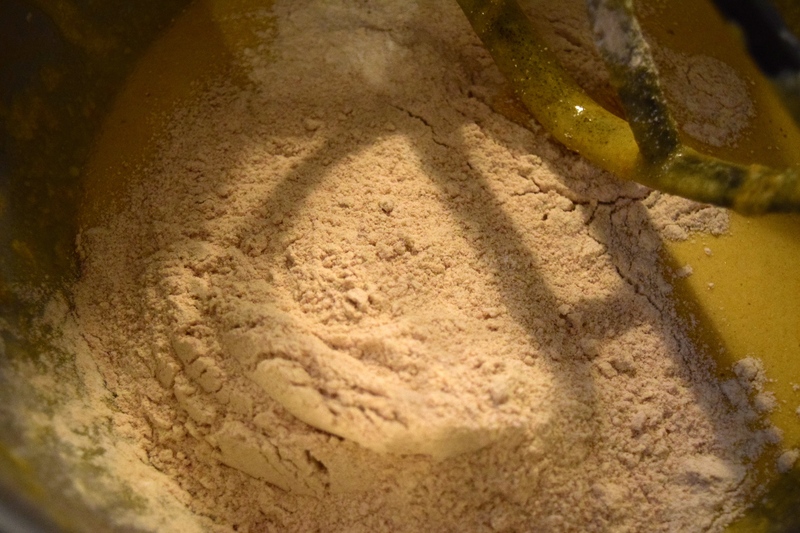 Add flour mixture to batter and stir gently for about 30 seconds until just blended. Do not over mix. Now you have a bowl of batter and a bowl of stiff egg whites. 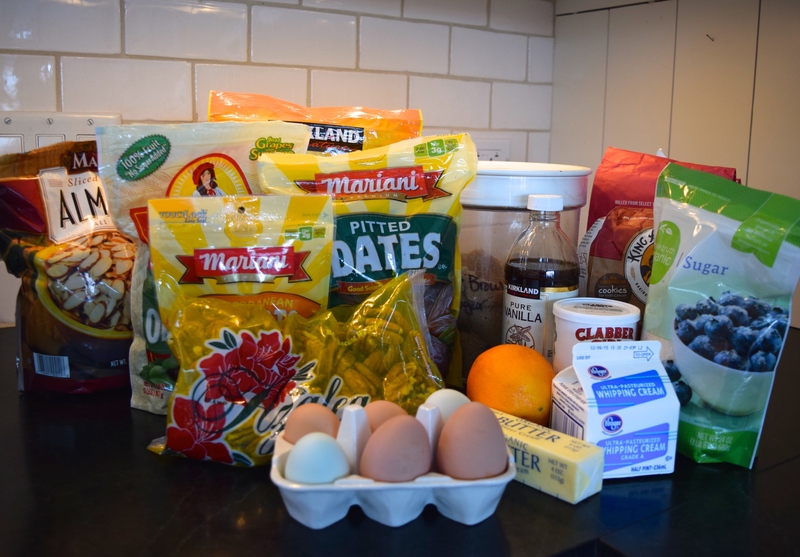 Fold egg whites gently into the batter and blend until just mixed. 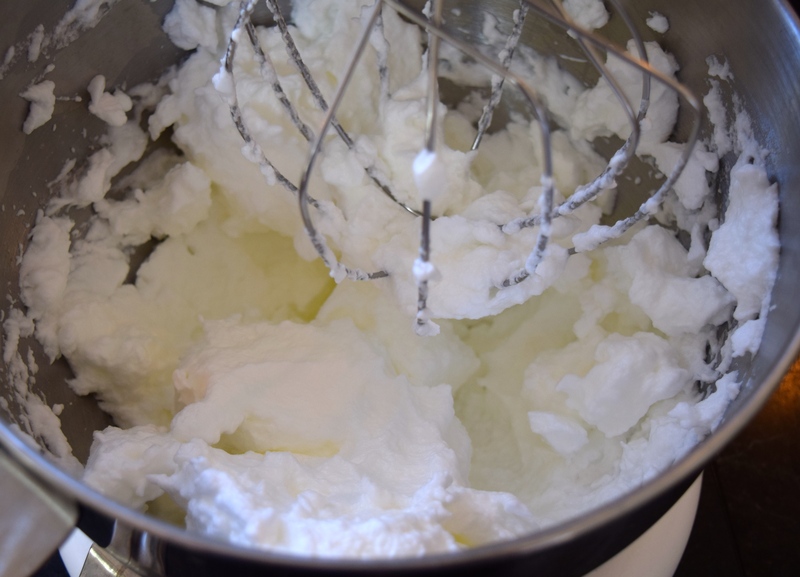 Adding fluffed up egg whites like this makes your batter lighter. 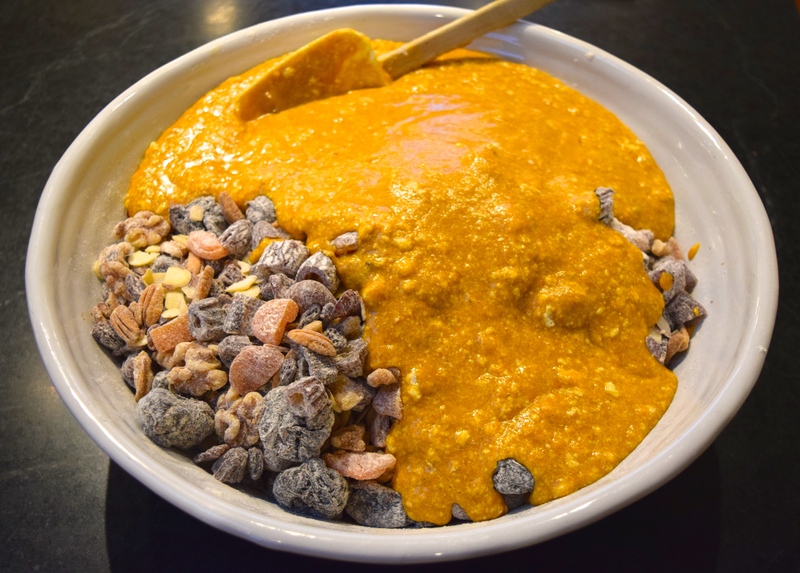 Stir batter into the bowl with fruits and nuts. Pour batter evenly into three loaf pans. Use your fingers to create a mound down the midline of each loaf pan. As I mentioned earlier, an attempt to not line the pans resulted in the bread sticking to the mini loaf pans. The foil-lined pans released freely. 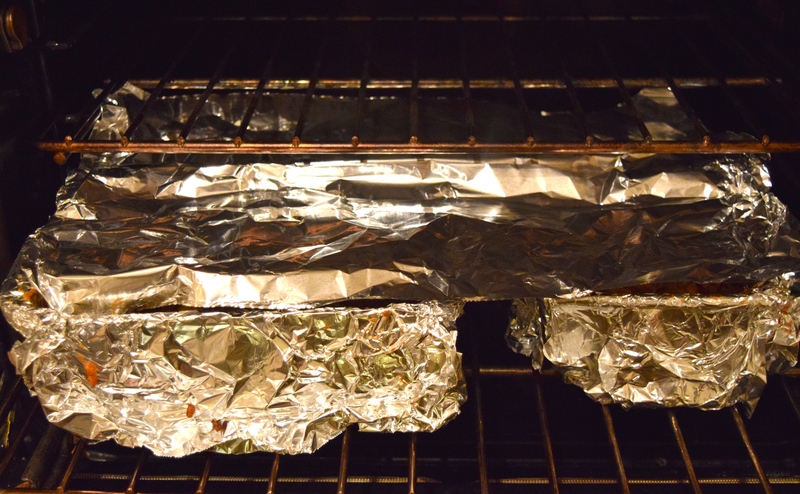 Bake covered with a sheet of foil for 40 minutes. 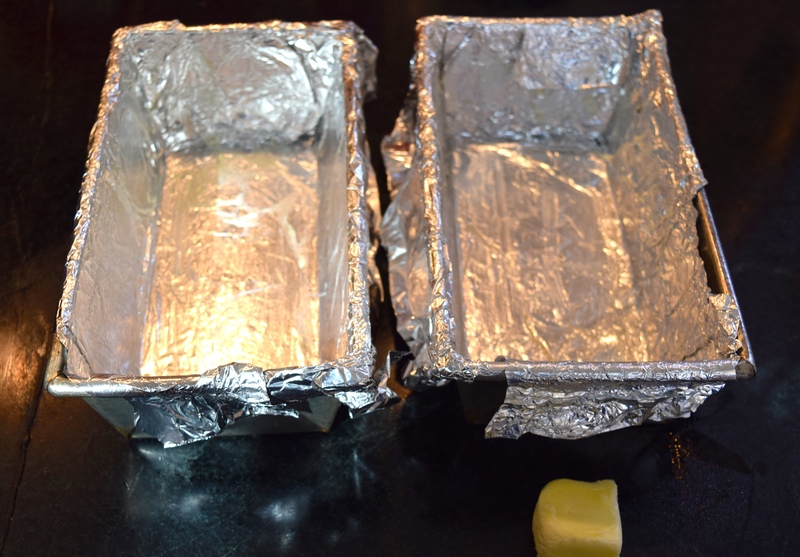 After 40 minutes, remove foil and bake for another 40 minutes. Loaves will be medium brown in color when done. Oven temperatures vary, so check color at 30 minutes. You can’t rely on the knife test to check for doneness because it continues to come out with crumbs on it, even when the loaves are done. This bread freezes well. I found one in my freezer that was one and a half years old. When I thawed it, I was totally prepared to throw it away, but it was perfectly fine to eat. Great idea for Easter gifts! And gifts for my lovely cleaning lady & handyman- both don’t cook!! I am torn each and every time I read your blog. Part of me wants to go and make whatever you’re making, grow whatever you’re growing and raise whatever you’re raising. The other part just wants to go sit at your house with a cup of good coffee, soak up that Judy goodness and WATCH you make, grow and raise.